Tree-ring patterns of Picea abies (L.) Karst. both unaffected and affected by Heterobasidion parviporum were analysed in three mature stands located at different elevations in the Eastern Alps. The main objectives were (1) to clarify the role of climatic conditions on infected trees; (2) to estimate indirect volume losses due to the prolonged presence of the fungus within the wood. The low elevation site showed the highest growth decline in the last decade, whereas all infected trees at medium and high elevation showed a slow growth decline over many decades. We hypothesise that infection could be dated over 80 years at the highest site. Fungal attack made P. abies more susceptible to drought stress at low elevation site. 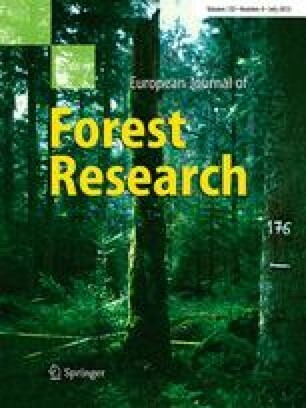 Both infected and healthy P. abies at medium and high elevation showed similar climate–growth relationships, suggesting that the same driving environmental factors influence their growth. At low elevation, H. parviporum was seemingly more aggressive, causing a more rapid decline, decreasing the ability of host trees to cope with drought and, in some cases, inducing cambial activity to stop. P. abies at higher elevation, however, exhibited a very slow decline and no sign of increasing water stress since the influence of climate on tree growth was the same for both infected and healthy trees. This study was supported and co-funded by the ‘Fondazione CARITRO—Cassa di Risparmio di Trento e Rovereto’ with the project ISOCHANGE. The authors wish to thank Magdalena Nötzli and Anne Verstege (WSL, Birmensdorf, Switzerland) for valuable laboratory assistance, Luca Ziller (FEM-IASMA, S. Michele a/Adige, Italy), Vivienne Frankell for correcting the English text and the ‘Magnifica Comunità di Fiemme’ for allowing us to sample the trees. The authors wish to thank two anonymous reviewers for their insightful and helpful comments on a previous version of the manuscript.